Deselection, anti-Semitism protests and of course, Brexit could all define the event in Liverpool. 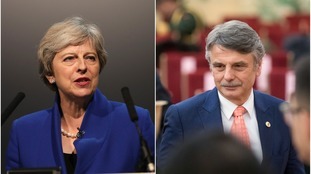 “Tens of thousands” of jobs at the car maker will be lost if the UK leaves the EU abruptly next March, Ralf Speth has warned. The company offered a Brexit risk-assessment said no deal from the EU would 'force Airbus to reconsider its investments in the UK'. Theresa May has written to the Isle of Man, Jersey and Guernsey regarding post-Brexit plans. Andrew Percy, the Minister for The Northern Powerhouse, says Brexit can be a good thing for industry in the North West. The MP was speaking at the conference for the Northern Powerhouse in Manchester. He said local industries now need to look further away from Europe for business opportunities. There are calls for the North West to unite and ensure its voice is heard during the Brexit negotiations. The region's local authorities are being urged to form a single team who will campaign to represent our needs when the UK meets Europe at the negotiating table. Think-tank IPPR North says the region lacks a coherent, united voice - unlike London and Scotland. The claim is supported by Leigh MP Andy Burnham, the prospective Labour candidate for mayor of Greater Manchester, who is calling for the north to have "a seat at the table". Angela Eagle has confirmed she has put in the paperwork to begin her bid to challenge and replace Jeremy Corbyn as Labour leader. Speaking outside her home in London, she told reporters she was "very much looking forward" to launching her campaign later today.